I was excited when I saw this app. I just got it and it looks great so far. I would like it if there were more Spanish cheeses included. I've heard Spain has some wonderful, little-known cheeses and I'd like to learn more about them. Could use a cheese shaker for random cheeses. Also needs more cheese updates as some are missing, would like to see all cheese types at some point Similar types and updates would be nice. Being in the wine industry I really love this application. It is extremely helpful. It could be a five star app if it had two additional features: 1. a way to "check off" cheeses into a favorites category for later reference. 2: the ability to submit to Steve Welch other cheese for him to consider in future updates. GREAT JOB!! When selecting cheeses a very important characteristic is how STRONG the cheese tastes. I love stinky strong cheeses but there is no way you can discover that Pont l'Eveque, for instance, is strong while a Montrachet is mild. Hope this type of tasting characteristic gets added to the Region, Texture and Milk on the front page for each cheese. Thanks for the updates,keep up the good work! 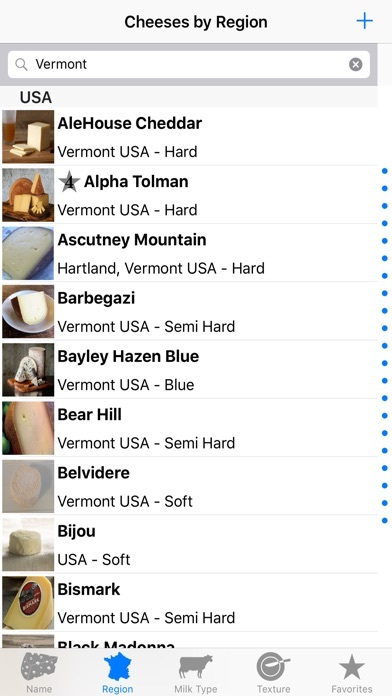 This app helped me find lots of new cheeses to hunt down and sample. Would be nice if I could check them off as I go or maybe have a favorites so I can quickly sort through as I wonder around the cheese shop looking for a new treat! Thanks. Would like to see them add "raw" or "pasteurized" after the type of milk description. Plus, there is only one listing for Canadian cheese (Black Diamond Cheddar), but Quebec has a large selection of great cheeses that really should not be ignored. Horrible app. The links in the favorite tab don't work, rendering the entire section useless. The icons in the menu are pixelated and the overall design and workflow do not follow conventions and/or basic principles of mobile UX. Very nice application, impressed by the progress over the years, very good implementation for the iPad. Thank you, keep up the good work. I like the email feature. I would like to change or add a photo. User can include photo of a new cheese but cannot change the photo of an app provided cheese. I would also like a section for recipes e.g. Cheese plate combos. Good idea, horrendous mistakes. How could "Queso Oaxaca" possible be from the US? This cheese was first made in Mexico. You can't associate a cheese to the US just because an American company makes it too. It is like saying that pizza is an American dish because Dominoes and Pizza Hut are big pizza companies. Completely disappointing! The selection of cheeses is very limited, but the most frustrating thing about this ap is that THERE IS NO WAY TO ADD A CHEESE to the list. This could be a fabulous ap, but it needs two things: (1) an "add cheese" function that allows users to add selections (like Tomme de la Chataignerai) and (2) a way for the ap to report these adds so they can be considered for future, regular updates. Cheese is too complicated--you need a social network to create a valid list. Love the app as you can find most items or add your own. No crashing or other problems. But could be great I you could sync your library between devices! This is a must needed addition to the app. Would rate it 5***** if it had this ability. An app you pay for should not have ads. Fromage costs $3 and then links to a website that sells cheese. And the list of cheeses is way too short and I found the descriptions lacking, giving no indication of quality. There is not really a quality search function. I expect I'll just delete it because I haven't seen any benefit. Great app, keep it up ! 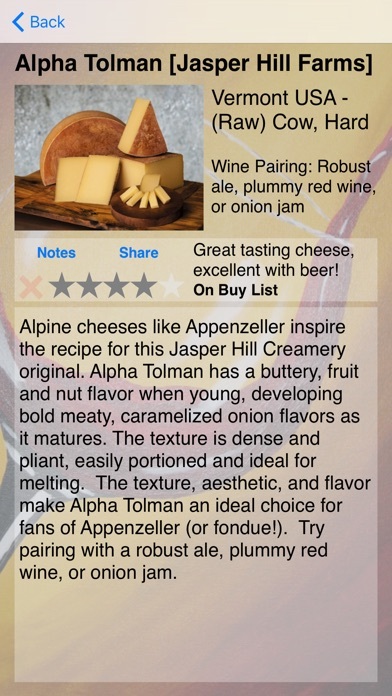 This is a nicely written app with great descriptions, perfect for selecting then tracking my favorite cheeses. Search works great and I can find just about any cheese I look for. I can add my own cheese if one is missing from my area. The cheese ads are helpful when I'm interested in buying on-line, but I usually turn it off by setting the preferences for the app using Apple's "Settings". Overall, great job, I give it 5 stars!! Please add "Cambozola Black" & "Old Amsterdam" - two of my favorite cheeses or at least give me an option to create a list of cheeses that I like but you don't have on your list. Thanks & I hope to be heard. I love that this exists. Could it be better? Probably. Is it still awesome? Yes. If I were to nitpick, I'd ask for more ways to sort, filter, and search, but whatever. It's a fricking cheese app. Great pictures and descriptions. I was trying to find a way to record cheese experiences and this works fine. It has most cheese I've ever heard of and I can add those it doesn't have. Rating is cool too so I can look back to see what I liked. However it's tough to search thru "only" that which I have rated. I should be able to get a sort by number of stars and by Those I've edited. There needs to be a way to get a shopping list from the TRY category. Then, I would move that into RATED so I know I've tried that one. FAV is too broad. And what about a HATE catchier? So if I could search be number of stars in the rated list, I'd be able to use the database I am building better. 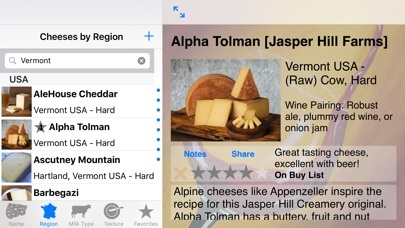 Love this app, but in the search mode there's no option for finding cheeses by what wine styles they pair with. This would be ideal for wine lovers who would like to search for the right cheese to go with their favorite glass, but know less about cheese than wine. Sort of a reverse lookup feature, like the region option? Great app. Could use an index as a search option. For instance, why scroll through the whole list of cow's milk cheeses when you want to get to the goat's milk? Also, please divide US cheeses by region, so we can find local cheeses. Overall, this a very well conceived and executed app. My reasons for giving this app only 3 stars are these. After a user has tasted a cheese and taken the time to enter their notes about the cheese the developers should display an icon in the left pane in the menu item of the cheese indicating that the user has rated and created a note about the cheese. You might consider displaying the number of stars the user assigned and display an e-Mail icon if the user sent an e-Mail about this cheese from Fromage. I do not know if every cheese in the world is listed but it's likely that every cheese in the world is listed. The developers should allow users to add cheeses,entering the same parameters as the developers; Region, Milk, etc. An additional option would be to create an e-Mail Developers button enabling the user to send information on user discovered cheeses to the developers. Like many users I have this app on both my iPad and iPhone 4; therefore, I believe that most users would appreciate the developers adding an option to sync the user rating and notes on all devices. The developers have designed and delivered a very well organized and user friendly app that I like very much but I think a 5 Star app has to be very special. The features/options I have suggested would make this a really special app. Bought this app and certainly shows and does what's it was designed to do. Would like the ability to increase the picture size and add notes cleaner, like specific wines users have paired. All in all a must have app. Great app but bugs need to be fixed. I can't seem to add anything in "favorites", "buy", "try" or "add my additions". The "save" button doesn't work because it is greyed out. And I can't select any of the above categories. As a cheese lover, I would like to have had a more comprehensive listing. I had ratted a Portugese cheese recently and wanted to look it is using this APP, only to discover that no cheeses from Portigal were listed. I had do do an Internet search in order to get the information. The APP could seriously use some updates. No Gruyere or Emmentaler from Switzerland. Those are basics. I can't recommend it. When you click "send" the email disappears quickly into the top left corner. Please fix. App claims to be functional on both iPhone and iPad. Works fine on my iPhone 5S (5 Stars). Not at all on my iPad Mini. Both running iOS 7.1.2. IPad version starts then takes you to a type of cheese. No menu. No search. No ability to get off the page. Finger swipe. Tap. Pinch. Tried every known trick, even reloading, no luck. Two stars for all iPad users. 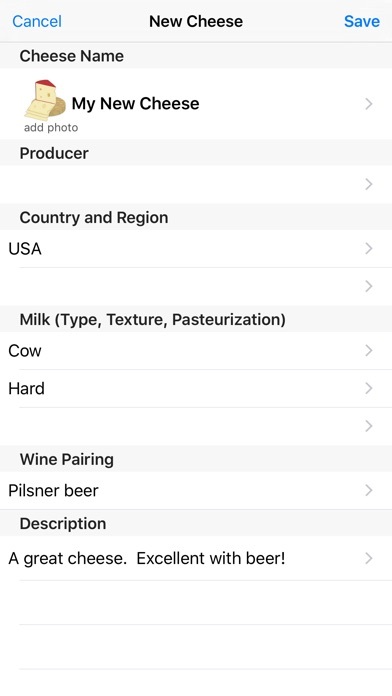 App is decent but you need the ability to add cheeses and brands/ producers of cheese types already in the app. For example, there are lots of English cheddars, but I might want to remember I like Keen's. Good app - almost there! Updated review - Well an add your own cheese feature has been added which is great. BUT ony first gen touch I can not save custom entries! The save button just does not function. Please fix! The search feature doesn't work as well as most others do. It "misses" cheeses that are included. I paid for this app so I shouldn't have to see ads. I'll get a free app if I want to put up with ads. I love the variety and info, but agree with an earlier reviewer, how do I find the ones I have rated, with stars? Also not clear how to put them in favorite. Am sure I will use it anyway, as a resource. It's sort of unbelievable that there's no way to add a cheese. Especially since the provided selections are somewhat limited. Expensive for what it is. Needs a suggest function and a way to request that cheeses be added to the database. The US section is really weak. Searchability appears to be by cheese name only. So, for example, you can find "Applewood Smoked Chevre", but you can't find all cheeses that have the word "apple" in the content. It seems like the content is merely advertising verbiage copied from cheese seller websites. For example "Baked Brie is a high quality appetizer that is perfect for holiday entertaining...wrapped in a savory brioche dough and baked to perfection". Baked to perfection ? What is this, a Chili's menu ? And another thing. For "Humboldt Fog" the Region is USA. Gosh, that's kind of broad. Would a wine reference state the Region for a particular Pinot Noir as "USA" ? Speaking of Chevre...I would like to see a dictionary. What exactly IS chevre ? Brie ? Gouda ? There are categorization icons on the bottom (Search, Region, Milk Type, Texture) but only in the Search is there a vertical letter index to speed finding what you are looking for. Be prepared to do some finger scrolling on the others. For example, imagine how many "France" cheeses you have to scroll through before you get to "USA" cheeses. 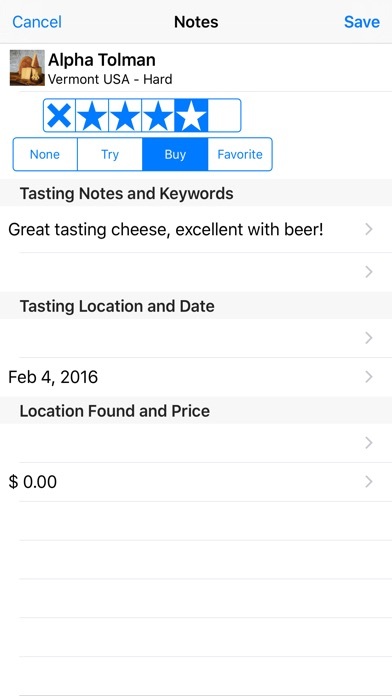 The favories/Notes feature seems to be well done, with a 5star scale, Try/Buy/Favorite taggability and space for tasting notes, location and date, and price. Some weaknesses but gosh, isn't it great there's a cheese app for the ipod ? All in all, a good start. Needs better searchability, and more reference content. A good start, but the American section is missing most of the fine artisan producers that are so exciting to watch. And Baked Brie?? Come on folks, that isn't a cheese, it is a preparation, and does not merit a listing here. There are many cheese apps available, but this one, IMHO is the best by far. Not only does it provide basic info and color photos within its own cheese-cyclopedia, it allows you to add YOUR OWN cheeses and comments, and that is what it comes down to: do YOU like the cheese or not, and how would YOU describe it. A paid app that still has ads? I thought the point of a paid app was NO ads. Also, it tells you next to nothing about the cheese you're looking at. The amount of information you would have to add to this to make it worthwhile would take eons to type. Completely disappointing and a waste of money. Wish I could get my money back. Perhaps a one-star review will be considered harsh, but let's look at two key facts here: 1) There is very little material in the write-ups on the various cheeses (telling me that a cheese is semi-solid is something I could determine by squeezing the package, thanks!). 2) This is not a database of cheeses, it's a pack of index cards on a computer. In other words, if this appication used a database engine it could be useful even with its woefully scant descriptions. If there were a set of filters available you could, for instance, say: I want a list of all mild semi-soft cheeses from France or Italy that go well with the wine I have in my shopping cart. This app is not even remotely capable of such a thing. For what it is, I think .99 cents would be fair for this app. Three times that much is simply a ripoff. A great almanac to start from and ability to add own cheeses. Would love it if I could compare notes with the general public and see what hey had to say. I also would like a "never again" button, like the "try/buy" so I will know never to get it agian and take it out of my search function forever! Love the app. Well done. Christmas was fun this year. Does not make regular updates to the app; does not have a good selection or information about the cheeses. The information and variety of cheeses is intriguing. Why no Monterey Jack? Nice overview of cheeses but it would be a Four+ star if one could add cheeses to the list or even take some out (laughing cow makes the list?). Also the built in advertising strikes me as a bit cheesy. ...but no syncing across devices? For the ❤️ of Cheese! I love this app! I’ve learned so much from it. Who doesn’t love cheese? If you love food, love cheese, have a taste for culinary knowledge and finer things... It’s a great investment, you need this app! It’s amazing!